LPC LAHORE: Master Paints/Rizvi’s, Barry’s and Diamond Paints/Guard Rice won their respective matches played on the second day of the ongoing Hamdan Holdings Punjab Polo Cup 2018 here at the Lahore Polo Club ground on Wednesday. Juan Cruz Losada led Master Paints/Rizvi’s to a thrilling 5-4 victory against Master Paints Black. Losada struck fabulous four goals in his team’s triumph while Hamza contributed one to complete the tally for the victors. From the losing side, Hissam Ali Hyder scored a brace while Gerardo Mazzini contributed one. Master Paints Black opened their account through a field goal by Hissam which was soon equalized by Master Paints/Rizvi’s, when Hamza slammed in a field goal. The second chukker was dominated by Black, who struck two – one each by Mazzini and Hamza, who mistakenly put the ball into his own goal – to take 3-1 lead, while Losada hit one for MP/Rizvi’s to reduce the margin to 3-2. The only goal of the third chukker came from Hissam, which gave Black farther edge of 4-2. It were all Master Paints/Rizvi’s in the fourth chukker where they banged in a brace through Losada to level the score 4-4. After that, both the teams launched a series of attacks on each other’s goal but they failed to convert more and the final whistle was blown. 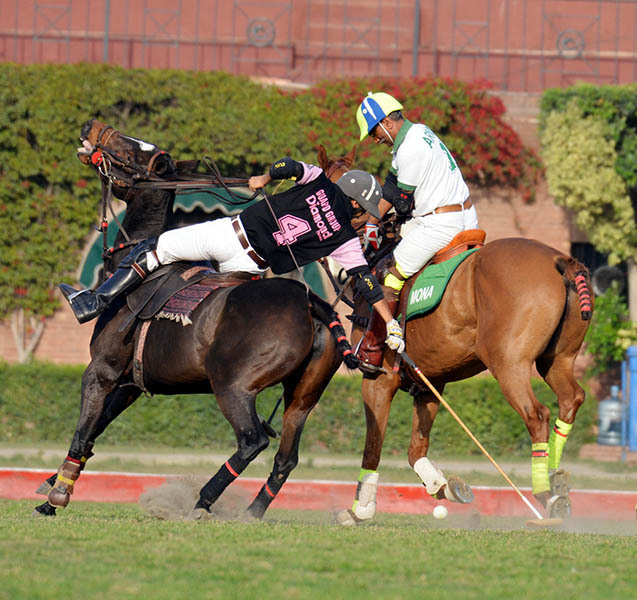 The match entered the sudden death chukker, where after some struggle, Master Paints/Rizvi’s succeeded in getting a 30-yard penalty, which was successfully converted by Losada, which helped them win the match 5-4. Barry’s overpowered Rijas Aces/PAF by 7-6½ in the second encounter of the day. Juan Maria Ginazu Tito emerged as hero of the day for Barry’s, as he hammered four goals while Ramiro Zavaleta, Nafees Barry and Bilal Haye contributed one goal each for the winning side. Although Deigo Araya struck all the five goals for Rijas Aces/PAF, yet his heroics couldn’t bear fruit for his team. Ginazu Tito scored the opening goal for Barry’s which was soon leveled by Deigo but Ramiro then struck a field goal to give Barry’s 2-1 edge. Nafees then fired a goal to further enhance Barry’s lead to 3-1 which was immediately cut short 3-2 by Deigo. By the close of the second chukker, Ginazu converted one more to provide Barry’s 4-2 lead. Barry’s dominated the third chukker fully and slammed in two through Bilal Haye and Ginazu to take healthy 6-2 lead. Rijas bounced back in the fourth and last chukker by hammering three goals to make it 6-5, but it was all they could get from the match, as Barry’s struck one more to win the match by 7-5. With one and half goal handicap advantage for Rijas, the final score was 7-6½ in favour of Barry’s. The third and last encounter of the day also proved to be a thriller where half goal handicap advantage helped Diamond Paints/Guard Rice beat Army by 5½-5. Macos Araya was top scorer from the winning side, which had half goal handicap average, while the remaining one came from Eulogio Celestino. From the losing side, Ignasio Negri also hammered four goals while Brig Zulfiqar Ali Baig contributed one but their efforts were futile in the end. 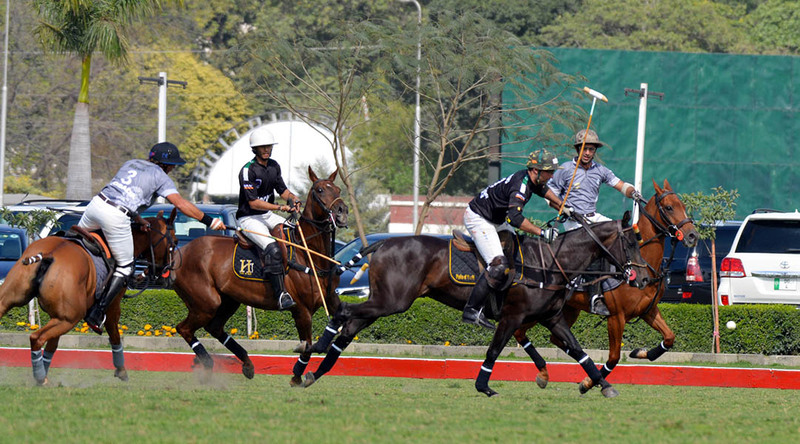 The first two chukkers of the match were evenly poised as both the sides scored two goals each. Eulogio and Macos were goal scorers from the winning side, while Ignasio hit both from the losing side, as the score was 2-2 at the end of the second chukker. Macos fired the lone goal of the third chukker to give Diamond Paints/Guard Rice 3-2 edge. 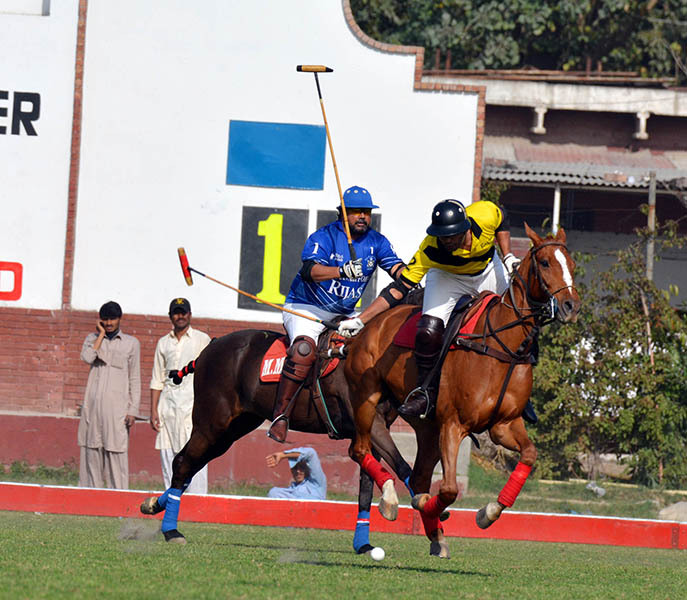 The high-voltage fourth chukker saw Diamond Paints/Guard Rice scoring two goals through Macos and Army hammering a hat-trick through Ignasio (2 goals) and Brig Zulfiqar (1 goal) to level the score at 5-5, which remained intact till the final whistle. Luckily, it was half goal handicap, which helped Diamond Paints/Guard Rice win the nail-biting match 5½-5. Howard George Smith and Jason Dixon supervised all the matches as field umpires.